With Arrow having such a tumultuous ending to last season, we had to wonder what is up with the next season. Well, The CW/DC is starting to make their character and cast announcements of late. Additionally, I have a lot of story updates for the fourth season, if you are of the mind to read through! For the DC comic fans, prepare yourself because Curtis will be a bit different than the comics book because the TV version will be a gay character. Aside from Mr. Terrific, we will also be seeing H.I.V.E. and Damien Darhk (Neal McDonough) plus we'll be getting a taste of Anarky played by Alexander Calvert. Anarky's alter-ego will be the deranged freelance criminal named Lonnie Machin. We're also going to be seeing more of the flashback world taking place in Coast City. Which, BTW, is the home town of Green Lantern. As the series starts ramping up with new and energizing story lines, some folks are seeing rumors and other bits floating about the web-o-sphere. I want to address a few things here. EVER since the first season, Oliver has always called his sister speedy. Which confused me, considering that im the comics, speedy was the nickname of his side-kick, Red Arrow. But then Roy showed up and became the Red Arrow, without the nickname. NOW, Thea has been training with "dad" and has donned the Red Arrow's outfit, thus, fulfilling that circle of confusion I had. And yes, Thea will be wearing the Red Hood and be Speedy in the upcoming fourth season. BUT THAT has me wondering with more questions. In the comics Red Arrow (Roy) could be looked upon as a chaotic good character. He had substance abuse problems and was good, then not good, then nuetral good and various other phases of trusting and not trust worthy. But in the show Roy already fulfilled that drug phase or with Thea having experienced the Lazarus Pit, will she be having side effects from it? There are fan theories floating around that she can become the Batman villain, Red Hood when all is said and done. Speaking of crazy and Roy, Thea's ex, is now using the alias Jason while working as a mechanic, folks online are wondering if he is not THE Jason Todd, who becomes Batman's partner, who later gets killed by the Joker in the 2005 story line, Batman: Death in the Family. But folks are saying that is a stretch. I don't see Batman showing up in Arrow. But I could be wrong. Also, something to know, is that Colton Haynes, who plays Roy, is returning in season four. On, on that Lazarus Pit thing, the producers have said or pointed out that "the person who comes out of the Lazarus Pit isn’t the same person who went in." I think there's something that will go on with Thea/Speedy next season. There are unofficial hopes that the Birds of Prey will come back together, considering we've already seen Black Canary (Katie Cassidy), Katana (Rila Fukushima), and Huntress (Jessica De Gouw) in the show. Though producers say they have a great Huntress story in mind. We don't know who, but Oliver will be running into an old friend in Coast City. Theories are saying that since Ferris Airlines has been referenced in the past in the show, there's theories that Oliver being in Coast City could have him running into Carol Ferris (Star Sapphire). We'll see. Side note: We saw Ferris Airlines a few times over on The Flash last season. Diggles character will have a helmet, and new suspicions say he will become The Guardian. This character, in the comics, this character depended on his comabat skills to put the bad guys down. Neal McDonough's character, Damien Darkh, WAS referenced in season three as a man who orchestrated several events in season three and had left Ra's League of Assassions with a group of loyal followers and water from the Lazarus pit. Those loyal followers, being the H.I.V.E.. 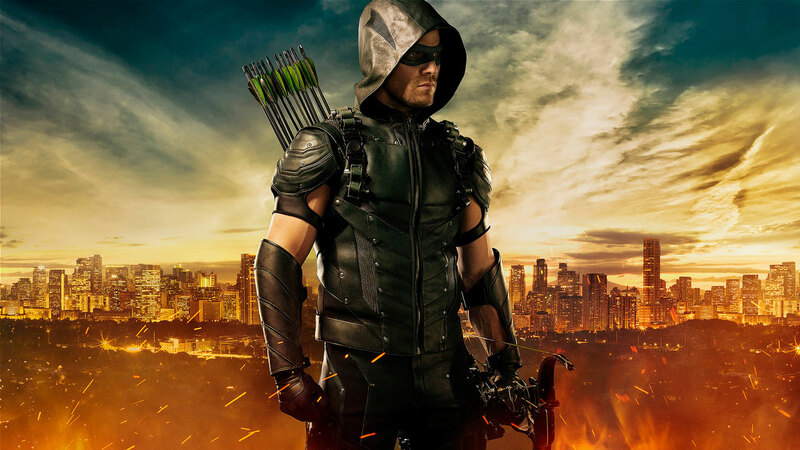 Season four of Arrow premieres on Wednesday, Oct. 7.